“MTG finance.” Now there’s a loaded term. We’ve applied this label because we don’t really know what else to call this thing we do, but the label itself has created its own problems. Using the word “finance” implies there’s a science to this game we play. It teases the idea that factor X will move axis Y and we can adjust our position accordingly and make some money. Comparing MTG finance to “real world” finance will quickly show you that we’re playing a game with money on the line and no real rules. Take a look at Hero’s Downfall … what’s the card worth? Well, depending on which storefront you’re selling from, it’s worth between $7 and $8. So that means your Hero’s Downfall is worth at least $7, right? Do you have a TCGplayer store? No? Then it looks like yours is worth $4.75, minus the cost of mailing the card to Troll and Toad. What’s Apple stock worth today? $125.32 at the time of writing this article. You know how much you’d get if you sold a share of Apple stock? About $125.32. You know how much Johnny Bigball’s Superbank would get for a share of Apple stock right now? About $125.32. You see the difference here? I could go on about the invisible hand and all supply and demand and all that other nonsense, but this isn’t an article about Econ 101 … this is an article about shock lands. Wasn’t that obvious? One of the way Magic behaves differently is what I call the emotional aspect of pricing. Every card has an emotional impact on the people interacting with it. Some cards carry a price far higher than demand dictates because people “feel” that price is justified—our past experiences with a card shape how we feel about it going forward. This is part of why Timmy believes that Ulamog is worth $40, the card “feels” like it should be worth that much. But I thought this was an article about shock lands? Of course it is, we’ll get there. Part of that “feels” pricing is because of the herd mentality that occurs with card prices. We set a price floor for a card, or group of cards, and no matter what happens we don’t go below that line. It’s a phenomena we’re seeing with shock lands today. Whaaaaaat? Everybody says that shock lands are a good pickup! And we’ve certainly convinced ourselves to believe it. Even me. And this is after I traded away more than 100 of the shocks I had acquired. Why would I do that? They’re a sure bet, after all? Because they’re really … not. We were all promised that shock lands were the next fetch lands. We were told that these lands were more than just euphemisms for genitalia (go ahead, run all ten names through your gutter mind and tell me they’re not) and we bit onto that bait and swallowed it whole. Hook, line, and sinker. Have you noticed what shock land prices have done since Return to Ravnica left Standard? With the exception of Steam Vents making a run during the Treasure Cruise fiasco, the answer is: NOTHING. You know why? Traditionally, cards lose value at rotation, but that didn’t really happen with shock lands because the collective consciousness of Magic players everywhere said, “They’re going to go up,” and everybody mentally locked in that last price and essentially refused to budge. 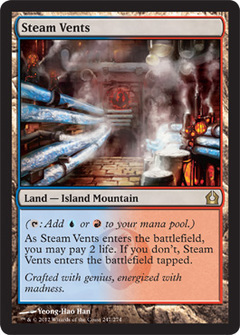 But shock lands are the cornerstone of the Modern mana base! Everyone that wants to play Modern is going to need them! Let’s do an experiment. We’ll look at the top 16 Modern decklists from this last weekend’s SCG Modern 5k and see how many shocks each deck runs … and we’ll go ahead and remove Tron and Affinity from that to ensure the averages don’t get skewed. For starters, no deck ran more than five shock lands, and of those shock lands used, no deck ran more than three copies of any single one. Only two archetypes ran the three-set: Blue-Red Splinter Twin and Green-White Hatebears. The remainder of the decks ran only one or two of any given shock land in their lists. But if you looked at fetch lands, with the exception of the Hatebears deck, which ran zero fetches, every deck than ran shock lands ran at least seven fetch lands, some as many as nine. In the top 16 there were a total of 47 shock lands and 80 fetch lands. Where do you think I’m placing my bets going forward? If you start plugging in four copies of any shock land into deck searches, you’re going to come to a conclusion: outside of Scapeshift and a couple fringe decks, you’re just not going to see four copies of any one shock land in a deck. The mana bases neither need nor want to run that many copies. This isn’t Return to Ravnica Standard where decks just ran twelve shocks and twelve M10-style dual lands. We also have to take into consideration the Modern format’s player base versus Return to Ravnica Standard. I think it would be a very generous assumption that the number of Modern players is 50 percent of the number of players we saw during RTR Standard. Then look at the difference in the decks: Modern lists are running three to five shock lands whereas those Standard decks were typically running 10 to 12. You could also go buck wild with comparative analysis of post-rotation price trends and see that cards typically “hit bottom” the January after they leave Standard and then start their slow climb back up from there. But the shock lands didn’t experience any “bottoming out” like you would typically expect—they’ve more or less held their pre-rotation prices with some minor slippages over the last couple of weeks. While we’re looking at the failings of shock lands, we would be remiss if we didn’t look at the fetch lands under the same lens. Fetch lands and shock lands are going to be reprinted cyclically going forward—count on it. Wizards has essentially told us that shock lands are the tier-one dual land for all prints going forward, so we know it’s going to be extremely unlikely that the fetch land / shock land relationship is ever going to be broken in Modern. This marriage is sure to last, but that does not mean that the fetch lands are going to remain faithful. You see, here’s the thing. Steam Vents is a good partner, but you can ask any Scalding Tarn anywhere and it’s going to tell you the same thing: it would rather be with a Volcanic Island. Face it, Volcanic Islands are just sexier than Steam Vents and everybody knows it … but Steam Vents is still a reliable and dependable partner, and we love them for that. Fetch lands have a bit more reach than shock lands because they’re getting action in Legacy. You can also check down Commander playability in favor of fetch lands as well. Take a three-color deck, any three colors. What’s your mana base going to consist of? Three shock lands – MAX. Three dual lands – MAX. Fetch lands … well, let’s say you’re playing red, green, and white. Every fetch land other than Polluted Delta represents a dual land from your deck. I don’t know about you guys, but when I’m building a Commander deck, my first card is Sensei’s Diving Top. Every. Single. Time. I don’t know how you guys like your Tops, but I like my Tops served with plenty of shuffle effects. Simply put, the fetch lands are more useful than shock lands and there are very few (plausible) scenarios where that changes. We also have to acknowledge that Modern’s mana bases are extremely diverse and are likely to continue down that road as Wizards digs deeper into its trove of dual-land designs. But Modern Masters II is coming out and Modern is going to be more popular than ever, right? Sure, kid, keep telling yourself that. To me, Modern Masters was the super-soldier serum given to Steve Rogers that made him into Captain America, but is another dose going to have the same results? What about another dose after that? We’ll see some modest expansion of the format with Modern Masters II, but I doubt a second shot in the arm is going to turn Captain America into the Hulk. For me, the writing is on the wall: shock lands were a bust and the potential upside pales in comparison to most other investments I could or would be making. I’ll take my time trading these away for more enticing prospects (like fetches or foil fetches) as the price is likely to stay in a nice stagnant holding pattern for the foreseeable future. Even if these cards do creep up, there is a ceiling. Wizards will reprint these cards. It’s not a matter of “if” but “when” at this point. Ravnica was a blockbuster plane both times we visited, so you can be sure that it’s only a matter of time before we go back, and if Battle for Zendikar is any indicator, the amount of time between return trips to existing planes is likely going to lessen, especially with the new block structure going forward. Even as the self-proclaimed long-term hands-off guy, I don’t like shock lands as a “hold” any longer. I think the certainty of reprint combined with the reality of demand makes the window of opportunity on these cards far too narrow. What do you think? EDIT: I should also point out that this is an article about shocklands, not about fetchlands. I’m not advocating fetchlands as the next fetchlands, they’re not. My goal was to point out why the old fetches DID have more success compared to shocklands. Previous PostSeeing the UnwrittenNext PostThe Magic Market for the Rest of Us: Don’t. I will say this before anyone else points it out in the comments that there is a chance that the new PPTQ format changes will have a marginal impact on Modern demand. The answer is, don’t put money into either. With Return to Zendikar on the horizon- it’s a fools errand to invest in onslaught/ktk fetches. Updated the article to clarify what my point was, not to buy fetchlands … but that shocks are not the new fetches, and neither are fetches. 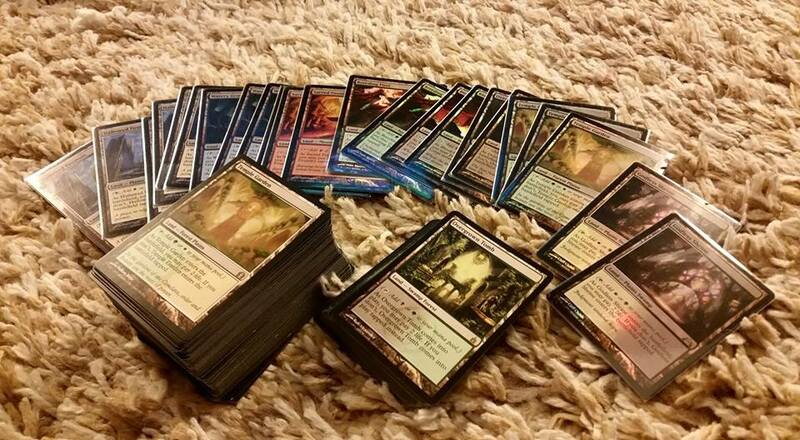 My playset of foil Overgrown Tomb has gained some value since rotation… at least on the EU market. Non-foils are dead. I’m convinced the same will apply to KTK fetches as they have been printed into oblivion. When I look at MCM I just don’t see how I would ever be able to sell a fetchland without constantly trying to go way lower than other sellers. The market is just flooded over here. I am still a fan of FOIL shocklands going forward, their prices definitely have a much better chance of going up over the next year than the non-foil versions. I kept telling friends and people at my LGS… you guys have no idea how many shocklands were printed, very few modern decks need playsets, some only need 1-2 of each type. With a transition from 4 of every shock in 3 colour decks, to 1-3 depending on deck in a smaller format than standard.. how can the price remain the same? They are gonna drop! People kept calling me crazy, get them while you can! The only investment I made into shocks, were 3 foil vents, and singleton foils of the rest. That way I can play Twin, Rug Twin, Delver, Rug Delver, Scapeshift, and any 3-4c zoo/aggro variant. I did however take advantage of people’s desire for shocks. I traded all my bulk rares and scraped the bottom of deckbox for shocks. Traded them into fetches when they were 95 and people wanted out. Then proceeded to trade the overpriced fetches into Goyfs. This is exactly it, beyond the reality that most decks only need 1-2 copies of any given shockland there is the fact that people don’t switch decks in modern as frequently as they do in Standard so there’s not even a lot of need to have the unused shocks “just in case.” 40-sets just don’t mean anything in terms of Modern’s mana bases. Good read. I guess I need to start moving Shocks into my trade binder to gradually liquidate them, much the same way that you have done. The good news is I don’t see Shocks getting reprinted AGAIN for a while, so I don’t think they drop in price from here. But there are probably better places to put your money (and Khans fetches ISN’T it). Thanks for the dose of reality, I needed it! I did not end up buying heavily into shocks this printing for the simple reason that I was watching supply and price and they simply have not yet shown any significant upwards pressure. However, I think that it’s a GREAT thing that there are blue chips in the magic investiverse. Healthy economies love government bonds. Shockmania is a fine example of why I prefer to invest with data in the driver’s seat, and theory in the backseat. You can use theory to set floors and ceilings (and it is a violable theory given that it’s run by a clutch of apes), but when it comes down to it, ALL market forces are subsumed into the price and stock data in the marketplaces; you only need that one muse. Shocks (and fetches) will always remain highly tradable so they’re fine as an intermediary between cards you don’t want and cards you do want … I will trade endless copies of cards like Butcher of the Horde into shocklands, but you won’t see me trading an Underground Sea into shocklands any time soon. I’ve always seen shocks as a more long-term hold. 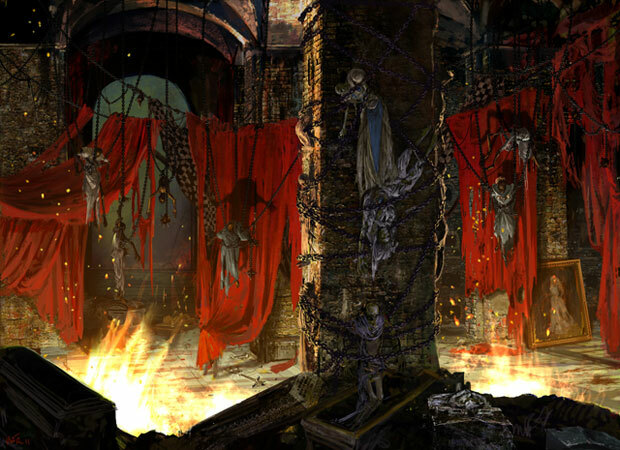 (Return to) Ravnica was (at that point) the best-selling set ever. I’m presuming it’s going to be at LEAST late 2017 before the market on them begins to tick up – there’s just too many copies in the ecosystem right now to have any kind of scarcity. The biggest single price motivator in that time will be the amount of players who convert to playing modern over the period next two blocks. This is a pretty long-term bet, would you rather place your bets on them making modest gains starting two years from now or trade them into cards that will make modest gains starting now? I’m going to start now. I would like to point out that In modern, khans fetches are being used in place of zendikar ones because they are cheaper. Driving khans fetches up and zendikar fetches down. If MM2 or BFZ have the zendikar fetches, the prices may balance out with the increase of supply. Meaning that Both zen and khan fetches all go closer to the $8 range. Just a thought. Correlation doesn’t always imply causation. Zendikar fetches are held in check by the anticipated reprint and reduced pressure that the Khans brought to the table. Khans fetches are holding their value because they’re getting used in Standard and Modern and Legacy. Before we had the Onslaught fetches in Modern we were forced to do terrible things like run Marsh Flats in Jund or Misty Rainforest in Naya Zoo, now we can run the exact fetches we need. I think all of them will hold healthy at $10+ for a long time, even with a zendikar reprint. Good Stuff, love this type of article. Magic has experienced some impressive growth of late, but now the player base is plateauing (not pun intended), and the market for modern (including staples) is being regulated better by wizards. As magic finance junkies, this is a great eye opener to the somewhat unsustainable gains we’ve seen since 2009. Sure, cards from short printed sets will still spike and legacy staples without chance of reprint will maintain, but the world of magic finance should also consider that spec options are shrinking. Bosium Strip is a nice example of how the ‘spec well’ is almost dry. The player base is not anywhere near plateauing yet, Magic is still experiencing continual year over year growth. Modern is essentially a toddler in terms of format maturity and Wizards is only tentatively willing to step in with needed reprints, they’ve stated time and time again that they don’t want to be in the secondary market. Mtgfinance isn’t just about picking which cards are going to spike, its about understanding cycles and the interconnectivity of cards. Bosium Strip is a poor example to point out that we’re running out of specs … it was a card in critically low supply because it’s been forgotten by history. It turns out that in conjunction with powerful delve spells, this card can be an absolute monster – a reusable Past in Flames. I say plateauing because Hasbro has noted slower growth in the player base lately…still growth…just not 25% growth. Also I get what you’re saying, but Wizards does satiate the casual players with additional copies of cards with printings in supplemental product, judge foils, and promos. So, sure they don’t want to get involved with the secondary market, but the ‘invisible hand’ does touch it. Believe me…I know about inter-connectivity driving change…I have a low four digit DCI number and have seen it all. I think bosium strip is a fine example. Like you said exactly, a forgotten card with potential. How many more reserved list cards have potential? Depends what new cards are printed certainly…but reserved list cards like Mold Demon from Legends don’t have anywhere to go beyond a few bucks for set collectors. I’ve been over the reserved list a number of times and grabbed a few personal sets here and there with potential. The next step is always re-evaluation based on new things (tiny leaders, etc). But, eventually we are left with Mold Demons and Wood Elementals. So, I apologize if i seem argumentative here, I don’t mean to be, i think we are mostly on the same page, but i wanted to clarify my position a bit. Please keep up the good work, and I appreciate your response and I look forward to more of your content! This was a really well written article and got my thoughts going about all the shocks I’ve acquired. Thanks for the read, it was a real eye opener! Also, what was the article about? Apple shares.. Right?